As someone who was born and bred in the US, my natural inclination is to reach for something sweet to start the morning. 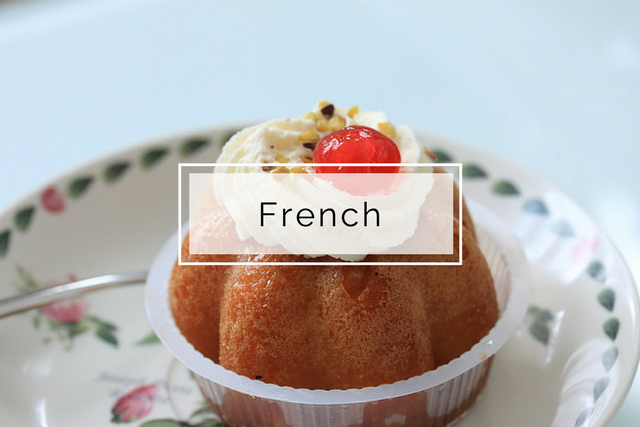 A bowl of cereal with a splash of milk has been part of my breakfast routine since I was a kid, and it hasn’t wavered much even after moving here to France where viennoiseries abound. 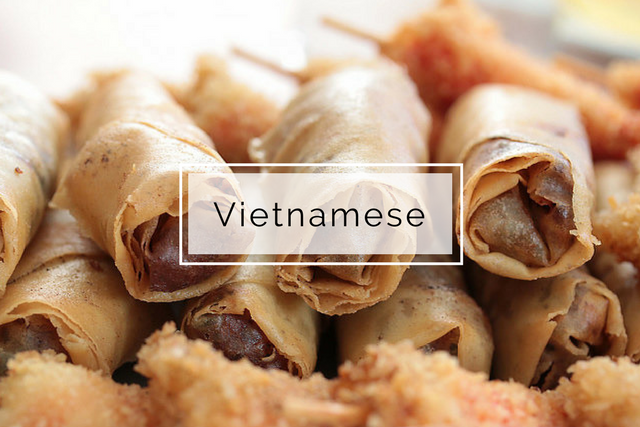 In Vietnamese culture, however, it’s not uncommon to fuel up in the morning with savory dishes. My stomach never growls for anything salty when I wake up, but the mister, who grew up in Vietnam, habitually starts the morning with what I would consider dinner. His typical morning meal includes a bowl of rice topped with something savory, such as caramelized pork ribs or ginger chicken. 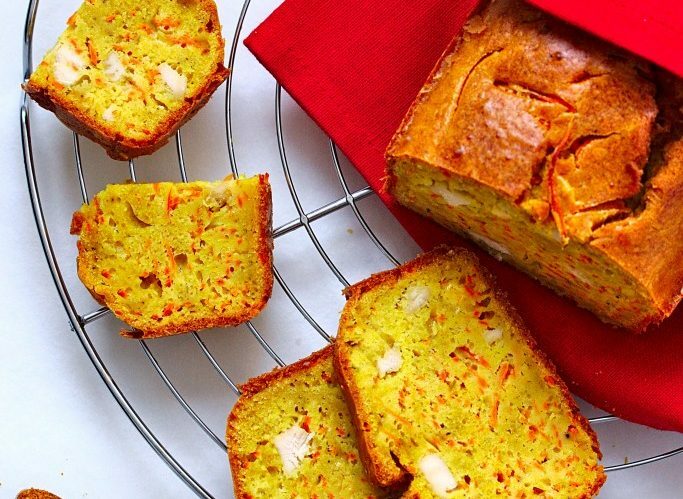 Sometimes, he’ll have a bánh giò, that is if I make them! 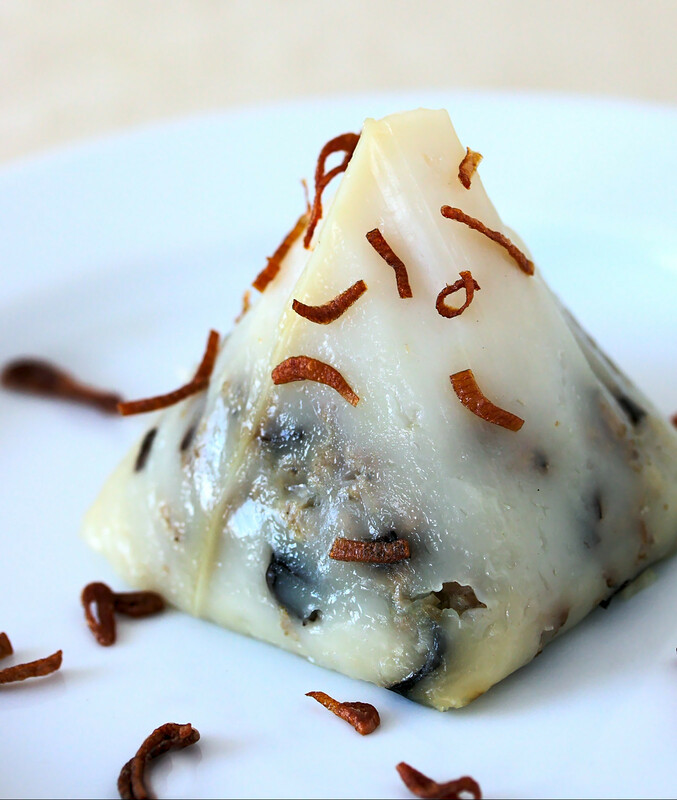 Bánh giò is a Vietnamese rice flour dumpling filled with ground pork sautéed with wood ear mushrooms and shallots. 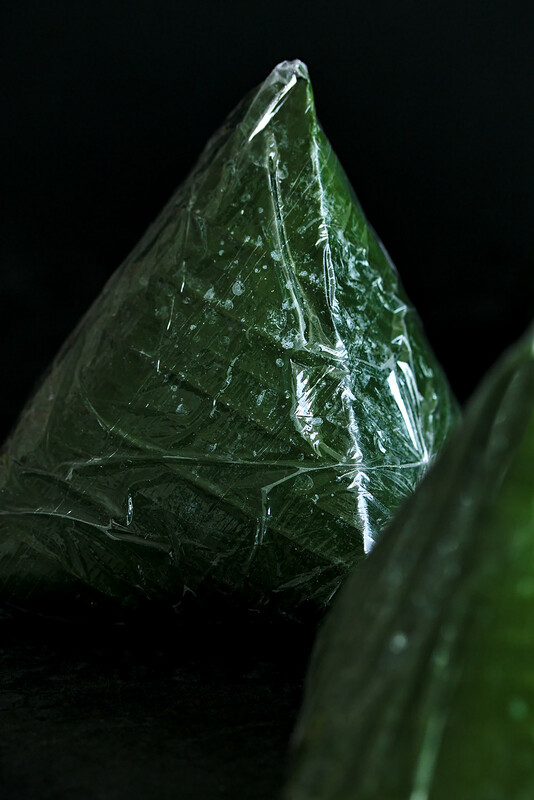 The pyramid shaped dumplings are wrapped and steamed in banana leaves, which give the rice flour dough a greenish hue and a slightly floral, leafy aroma. 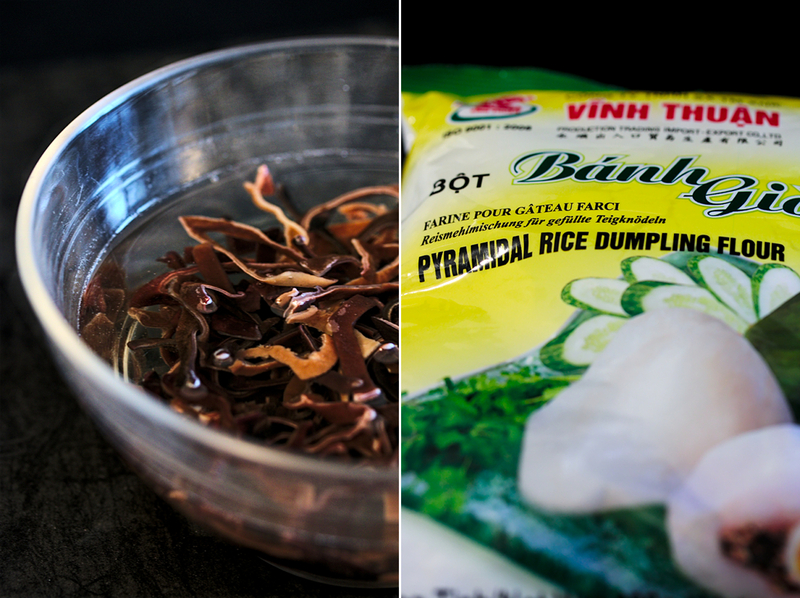 This North Vietnamese specialty is not a bite-sized dumpling like potstickers. One dumpling can be a meal in itself and is commonly eaten for breakfast. 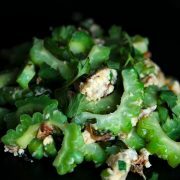 They can also be enjoyed as a snack or light meal at anytime during the day. The dumplings are served warm and can be eaten straight out of the banana leaf without any sauce or garnishes. 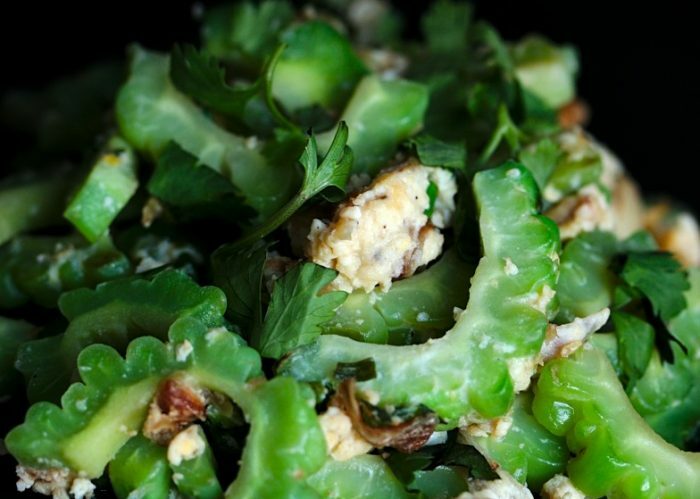 My mom says that they can also be dressed up as a heartier meal with a side of Vietnamese ham (chả lụa), garnished with slices of cucumber and dressed with nước mắm sauce. 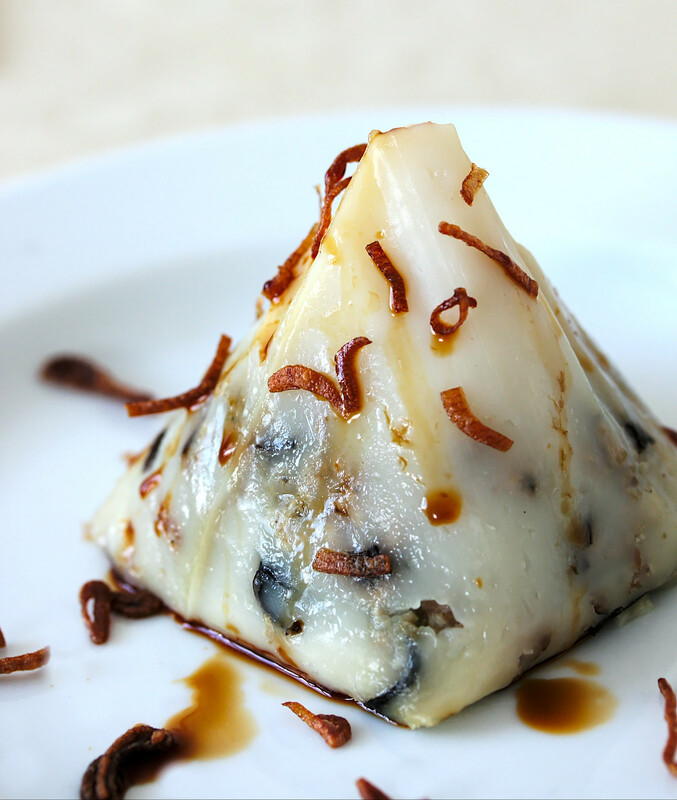 Though many Vietnamese people I know have recounted fond memories of eating these pyramid shaped dumplings during their childhood, I have no recollection of having ever eaten them while growing up. 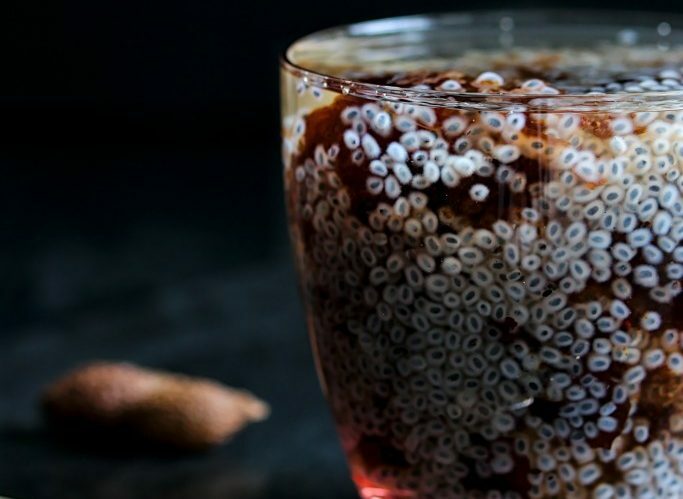 My mom told me that she used to make them when we lived in New Orleans, but my childhood memories during that time are pretty spotty or altogether non-existent. Because of my lapses in memory, I discovered (or maybe rediscovered) these rice flour pyramids when I came to France. My MIL would occasionally make them, but she never wrapped them in the shape of a pyramid. Rather, hers always looked like tamales. Though her way is much easier to wrap, I prefer the little pyramids because they always look much more impressive and appetizing when served. 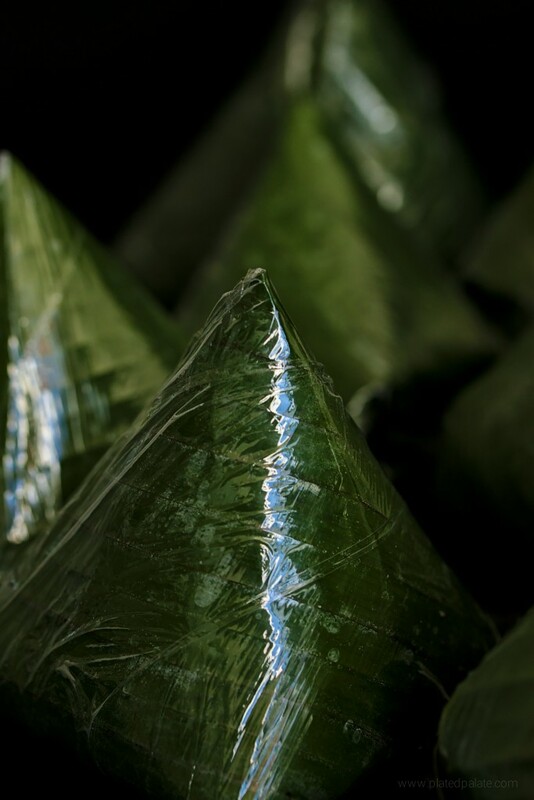 These little pyramid-shaped packages are made by first whisking rice flour with pork broth on the stove until it thickens into an opaque paste. The banana leaves are blanched beforehand to soften them and are then folded into what looks like a little triangular hat. 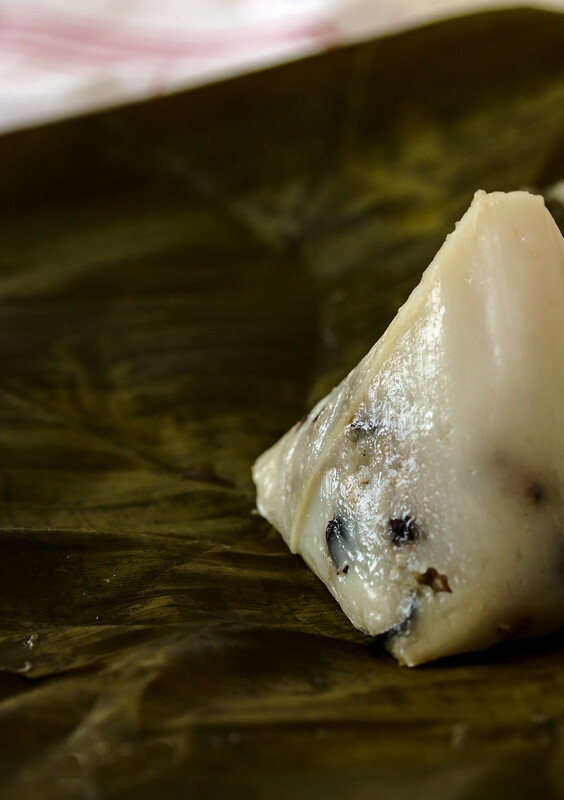 To assemble the dumplings, two layers of the rice flour dough with the filling in between are then added into the opening of each banana leaf pouch. 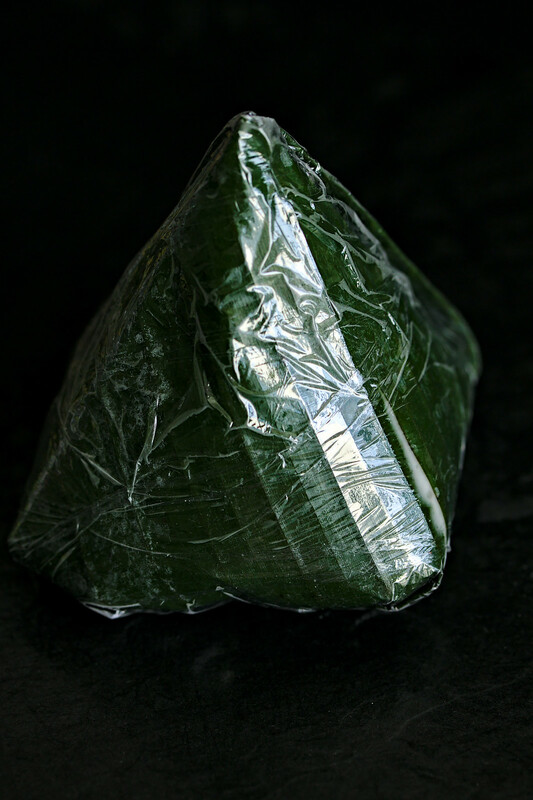 To seal the dumplings, the leaf edges are folded over and tucked into itself. 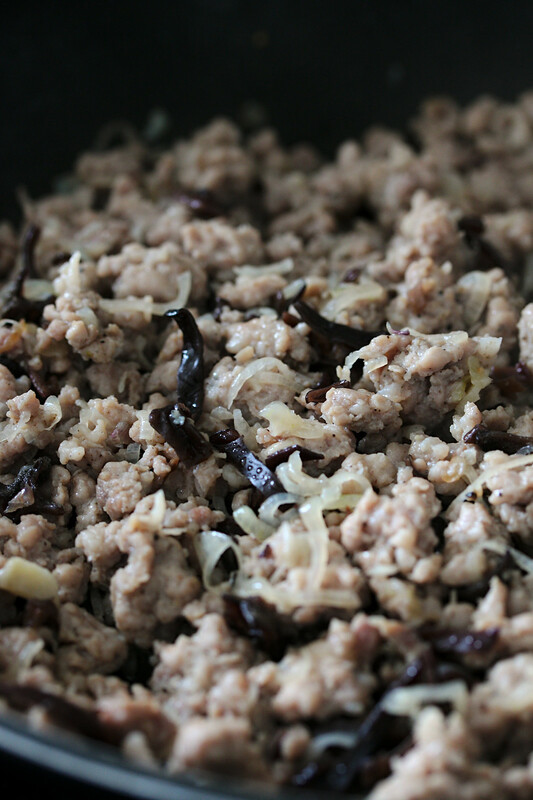 The pork filling is pre-cooked, but the rice flour dough is only partially cooked. So, the pyramid dumplings must be steamed for about 25-30 minutes to complete the cooking process. In France, I always find fresh banana leaves at the Asian grocery stores in the 13th arrondissement. While I was still living in the US, I had never used banana leaves before, so I’m not sure if Asian markets there stock fresh ones in the produce aisle. I do believe that frozen ones are widely available though. The rice flour mixture I use contains 80% rice flour and 20% tapioca flour. 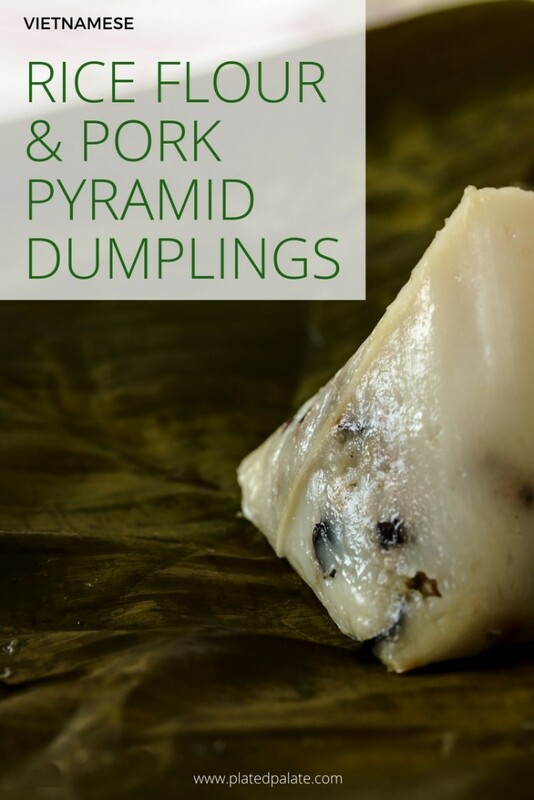 These pyramid dumplings can be prepared with pure rice flour, but tapioca flour or cornstarch firms the dough up a bit so that it’s easier to work with. To give the rice flour dough a richer flavor, I always use a homemade pork broth, but if you’re in a pinch, you can use plain water or chicken broth. If using just plain water though, additional salt should be added to ensure that the dumplings don’t come out too bland. Preparing these dumplings may seem daunting at first because it requires a bit of dexterity to wrap them. But, I assure you that after a few tries, you’ll get the hang of it. And if you don’t, you can always do what my MIL does and just wrap them like tamales. 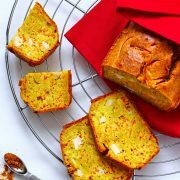 You won’t regret attempting this recipe once you open up the little pyramids and get a whiff of the steamed banana leaves! Though I doubt it’s very traditional, my favorite way to eat these pyramid dumplings is with fried shallots, Maggi seasoning and a generous dose of Sriracha. 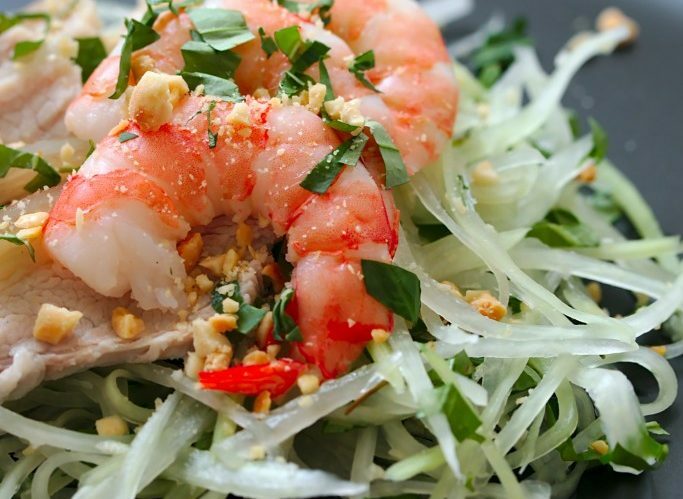 The mister, on the other hand, prefers to have them with slices of Vietnamese ham and doused in nước mắm sauce. What’s your preferred way of serving them? Cut the banana leaves into 30-35 cm long sheets. Rinse the banana leaves with water and thoroughly wipe them clean. Then, heat up some water in a large sauté pan or pot and blanch the banana leaves to soften them. Set aside to dry. Rehydrate the wood ear mushrooms by soaking them in warm water, and thoroughly rinse and drain them once they are soft. Coarsely chop the mushrooms into smaller pieces. Heat some cooking oil in a large frying pan over high heat. Sauté the sliced shallots until fragrant, but not browned. Add the ground pork and season with salt and ground black pepper. Once the meat is nearly cooked, add the chopped wood ear mushrooms and continue to sauté until the meat is thoroughly cooked. Then, add the fish sauce and give the filling a quick stir to ensure that it is incorporated evenly. Turn off the heat and set aside. Pour the rice flour mix into a large mixing bowl. Add the pork broth to the bowl while whisking to avoid any clumps. At this step, the pork broth should be room temperature. Once the rice flour dough is homogenously mixed with the broth, transfer to a sauce pan, place over medium-high heat and add the 2.5 tablespoons of cooking oil. 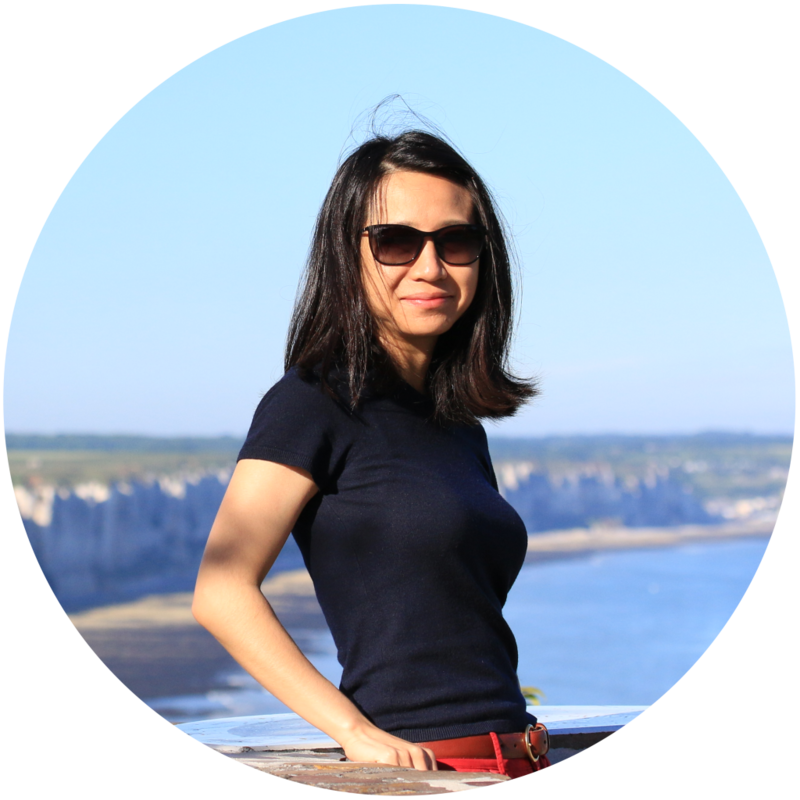 Stir continuously with chopsticks or a whisk. As the mixture starts to thicken, lower the heat to medium-low and continue to stir until the dough becomes thick and smooth. 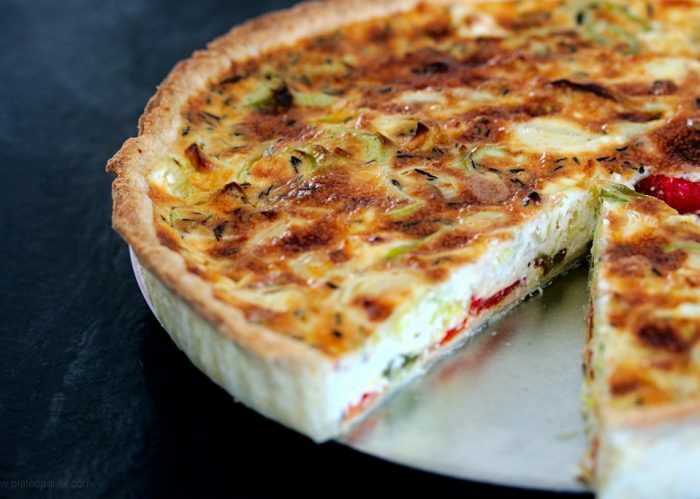 The thickness should be something similar to that of kid’s paste that kindergarteners use. If the banana leaf sheets are still moist, wipe them dry. Cut sheets of saran wrap to line the outside of each banana leaf. Then place the dark side of the banana leaf face down against the saran wrap. * Take the bottom right corner of the sheet and fold it diagonally, like you would a piece of paper to make one of those origami fortune tellers. Then, take the top right corner and fold it over, which forms a triangle. Hold the folded banana leaf in your hand with the pointed end pointing down. 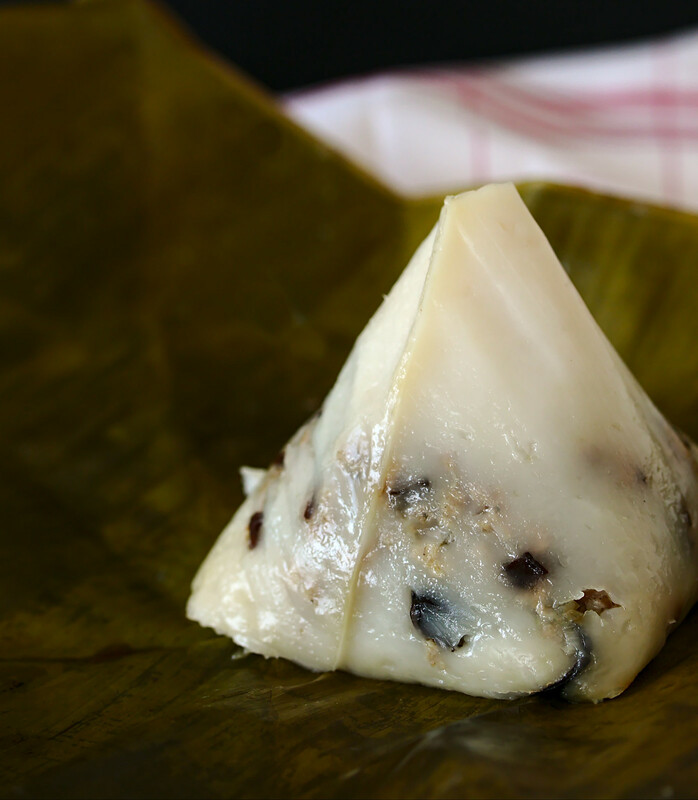 Scoop about 2 tablespoons of the rice flour dough and fill the pointed cavity of the banana leaf. Then, add 2 tablespoons of the meat filling and cover with another 2 tablespoons of the dough. Fold one of the pointed ends of the opening down and then fold the left and right sides down. Finally, fold the final corner down and tuck it into the bottom of the pyramid. Place the wrapped dumplings into a steamer and steam for about 25-30 minutes. Once removed from the steamer, allow to cool for about 10-15 minutes. These should be served warm, but not piping hot. I like to garnish these pyramid shaped dumplings with fried shallots, siracha, and a couple squirts of Maggi Seasoning, which is similar to soy sauce. My husband, however, likes to eat the dumplings with nước mắm sauce and some sliced Vietnamese ham (chả lụa). The dumplings can also be eaten plain straight from the banana leaf. *Note: Lining the exterior of the banana leaves with saran wrap is optional. The fresh leaves that I use are often not perfect and some have tears. Lining the leaves with saran wrap keeps the dough from seeping out and making a mess.